Stunning garments once worn by empresses and top-ranking consorts in the Qing dynasty played a significant role in announcing their identity and status. Court dress was a vital matter because robes and accessories functioned much like a uniform. One illustrated guide, commissioned by the imperial court in the mid-eighteenth century, detailed appropriate wear for a range of occasions, from formal rituals and court audiences to festivities and family banquets. Color, exquisite woven or embroidered motifs, and tailoring still provide clues about these important ladies and their world. Click on the hotspots below to decode these robes. An imperial woman’s “court robe” was known as chaopao. 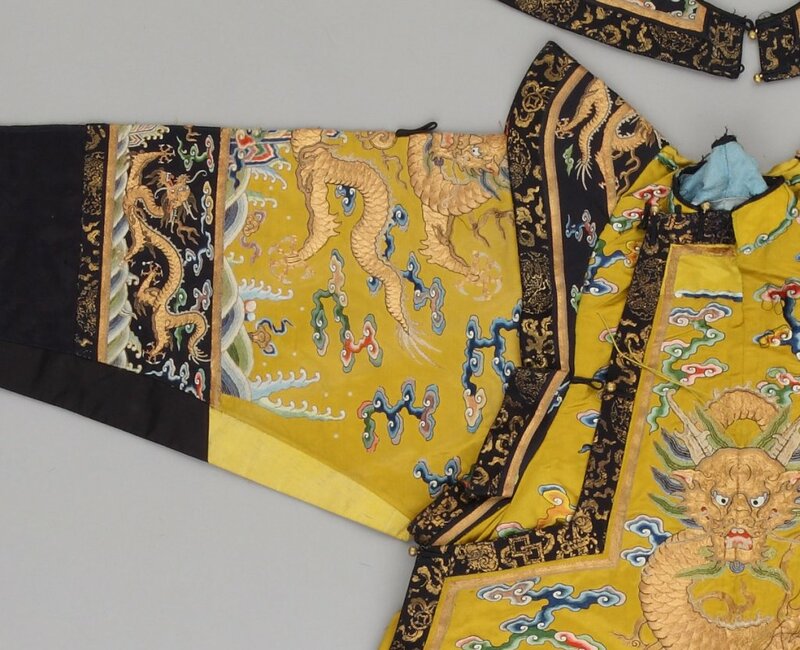 Only women of the highest rank—empress dowager, empress, and second-rank consort—were entitled to wear magnificent bright yellow court robes like this one on formal occasions. Jifu (“auspicious robes”) were worn for festive celebrations, family banquets, birthdays, and other important occasions that were less formal than ritual and state ceremonies. The body of the robe is cut from a single piece of silk. Seams run down the middle of this A-shaped garment instead of at the sides, as is common in Western dress. Inset: Hairpin with crab and reed. Daoguang period (1821–50), 1834 or earlier. Jade (nephrite), kingfisher feathers, pearls, ruby, and silver with gilding. Palace Museum, GU10223 © The Palace Museum. The winglike extensions at the shoulders and dark, decorated sleeve bands at elbow level were not on men’s garments. The empress also wore a floor-length, dark blue vest decorated with dragons, a long silk kerchief, and jewelry. The empress wore an elaborate headdress with her court robe. Phoenixes, the sovereigns of birds, symbolize her greatness. The rare freshwater pearls came from the geographic area that was the Manchu homeland and reinforces the ruler’s ethnic pride. The Manchus swept in from the north, conquering China in 1644 and establishing the Qing dynasty. In this portrait, Empress Dowager Chongqing wears a long vest in addition to a separate flaring collar around her neck. The blue vest muted the bright appearance of the woman’s robe. 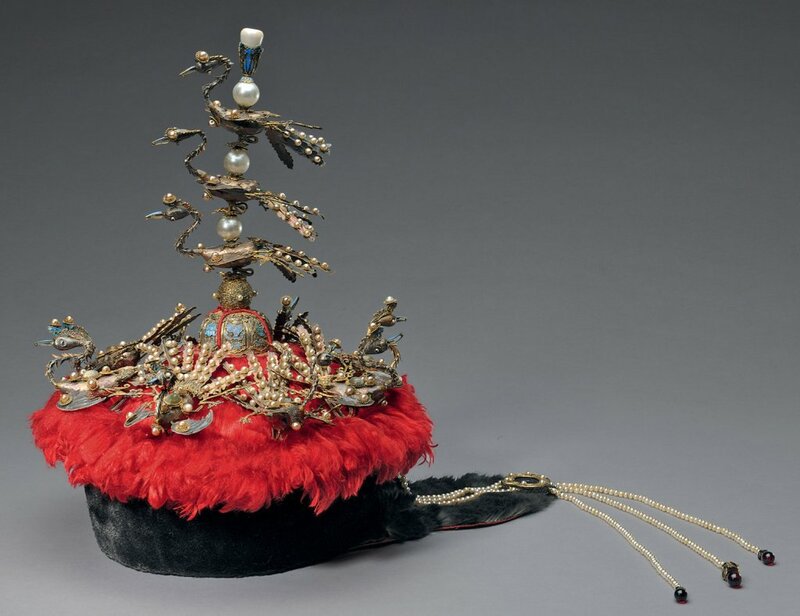 Since the emperor usually did not cover his robe, he not only outshone her, but he also subtly reflected the patriarchy and hierarchy of the Qing court. 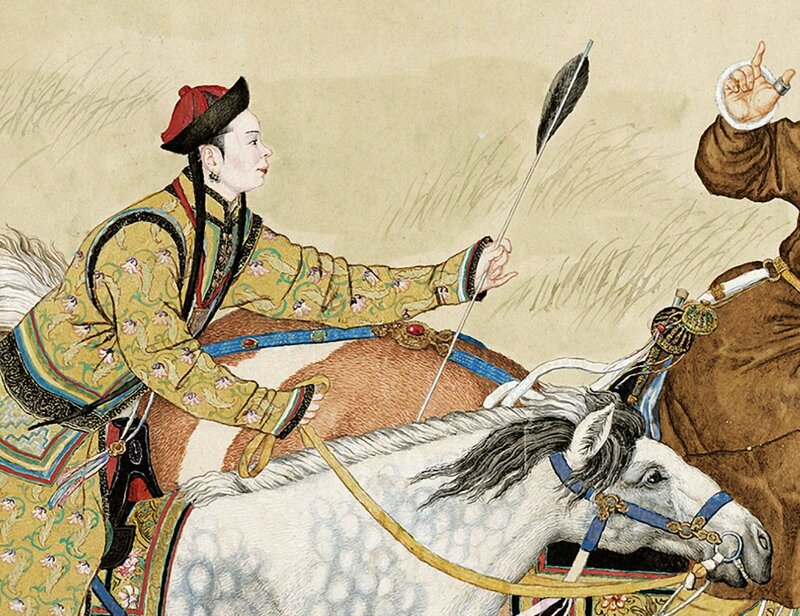 Only the most elite in the Qing court were allowed to wear brilliant yellow. The next tier down in status could appear in a more subdued shade of apricot yellow. Dragons with five claws were other symbols of the highest level of imperial authority. From head to toe, the empress dressed to complement the emperor and to reinforce his supreme authority and position as mediator between heaven and earth. The border at the hem of formal robes represents the earthly domain, where cresting waves crash into a mountain with three peaks. Dragons float among the clouds of heaven. Mirroring her husband, the woman who wore this garment symbolically connects the two realms. Eye-catching jewelry, especially hairpins inserted into an elaborate coiffure, were appropriate to wear with such a stunning robe. 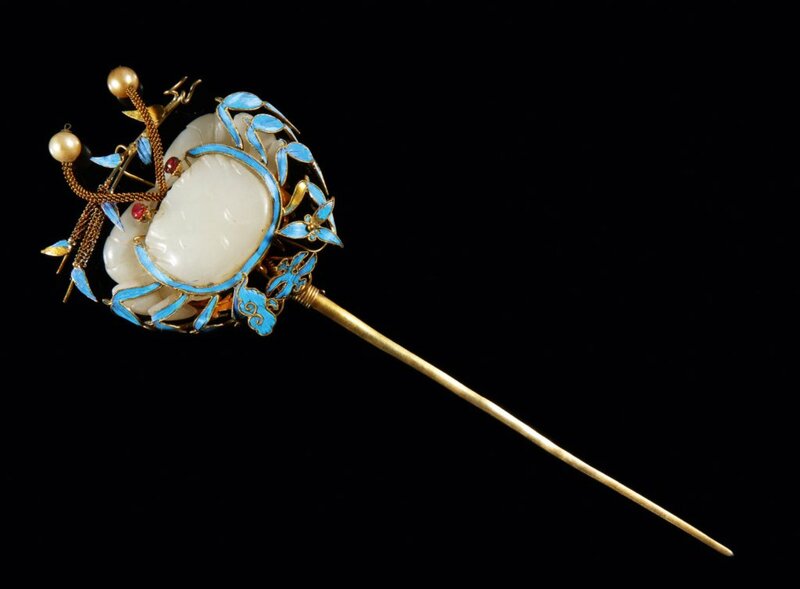 This hairpin in the shape of a crab refers to wishes for a son’s scholarly success. The bright blue feathers are from the kingfisher. Extended cuffs in the shape of horse hoofs probably refer to the ethnic origins of the Manchu. These expert horseback riders typically covered the backs of their hands to protect them. The narrow sleeves and extended cuffs of Qing court robes made a point about ethnicity. These tight, sleeves are distinctly different from the wide, flowing sleeves of traditional Chinese robes. Eight vases decorate the robe. They capture the sumptuousness of palace decor and represent the finest porcelains of the Qianlong period (1736–95). Each vessel sits on a custom-made wooden stand typical of eighteenth-century palace displays. The vases might depict actual objects owned by an imperial woman, such as Empress Dowager Chongqing, who was known for her love of exquisite treasures. Such exceptional embroidery was produced at the imperial manufactory in Suzhou. Tailoring was done in Beijing, where a pale pink lining and padding were added so the robe could be worn in cool weather. Plain, interlocking, satin, and seed stitches were utilized to lend texture to the flowers. Delicately embroidered shading produces the illusion of light and shadow. Auspicious symbols cover the robe’s surface. Butterflies, for example, can signify longevity. Another symbolic meaning of a butterfly was based on a homophone—two words that sound alike—of the Chinese word die. In addition to butterfly, it also means “to pile up or duplicate,” reinforcing the good wishes represented by the flowers. The vases are visual puns for peace since “vase” and “peace” are pronounced the same way in Chinese. Some of the flower names are also puns. For example, begonias in a vase mean “peace in the four seas,” a reference to peace around the world (sihai shengping).